X With a free and uncaring nature, it doesn’t mind if pieces break off while it rolls down mountains. X D’une nature téméraire, il se moque de perdre des parties de son corps quand il dévale les pentes. X De naturaleza descuidada y libre, no le importa dañarse cuando baja rodando montañas. X Di natura libera e incurante, non si preoccupa se perde dei pezzi mentre si rotola giù dai monti. X 산에서 굴러 떨어질 때 몸의 여기저기가 부서져도 신경 쓰지 않는 호쾌한 성격이다. Y Se mueve rodando cuesta abajo y sobre cualquier obstáculo, sin frenar ni cambiar de dirección. Y Si lancia in discesa, rotolando su ogni ostacolo senza frenare o mutare direzione. Y 언덕을 굴러서 이동한다. 방해물은 마구 짓누르며 나아간다. 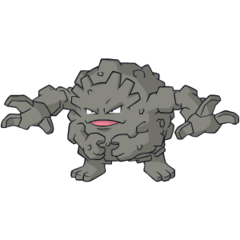 Omega Ruby Rocks are Graveler’s favorite food. This Pokémon will climb a mountain from the base to the summit, crunchingly feasting on rocks all the while. Upon reaching the peak, it rolls back down to the bottom. Omega Ruby Steine sind Georoks Lieblingsspeise. Dieses Pokémon klettert vom Fuße eines Berges zu seinem Gipfel empor und zermalmt dabei das Gestein. Wenn es den Gipfel erreicht hat, rollt es wieder herunter. Omega Ruby La nourriture préférée de Gravalanch est la roche. Ce Pokémon escalade parfois les montagnes, dévorant les rochers sur son passage. Une fois au sommet, il se laisse rouler jusqu’en bas. Omega Ruby Las piedras son la comida preferida de Graveler. Este Pokémon sube a la cima de las montañas devorando todas las rocas que va encontrando a su paso. Una vez que alcanza la cumbre, baja rodando hasta la falda. Omega Ruby Il cibo preferito da Graveler sono le rocce. Infatti è capace di risalire un monte dalla base alla cima, sgranocchiando rocce tutto il tempo. Una volta raggiunta la cima, si lancia in discesa rotolando. Omega Ruby 산기슭부터 산 정상까지 올라가는 동안 매우 좋아하는 바위를 으득으득 먹는다. 정상에 도달하면 다시 굴러 내려온다. Alpha Sapphire Graveler grows by feeding on rocks. Apparently, it prefers to eat rocks that are covered in moss. This Pokémon eats its way through a ton of rocks on a daily basis. Alpha Sapphire Georok wächst, indem es sich von Steinen ernährt. Am liebsten mag es Steine, die mit Moos überzogen sind. Dieses Pokémon frisst sich täglich durch eine riesige Menge von Steinen. Alpha Sapphire Gravalanch grandit en se nourrissant de cailloux. Apparemment, il a une préférence pour les cailloux recouverts de mousse. En moyenne, il mange une tonne de rochers par jour. Alpha Sapphire Graveler crece alimentándose a base de piedras. Y, según parece, las prefiere cubiertas de musgo. Cada día se abre camino comiéndose una tonelada de rocas. Alpha Sapphire Graveler si ciba di rocce. Pare che preferisca quelle ricoperte di muschio. Questo Pokémon mangia ogni giorno dieci quintali di pietre. Alpha Sapphire 바위를 먹고 성장하는 포켓몬이다. 이끼가 낀 바위를 좋아하는 것 같다. 하루에 1톤의 바위를 먹어버린다. Sun Mossy rocks are its favorite food. It can devour a ton a day while crunching loudly. Moon This slow-footed Pokémon moves by curling up and rolling instead of walking. With enough momentum, its speed can exceed 60 mph. Red Rolls down slopes to move. It rolls over any obstacle without slowing or changing its direction. Blue Rolls down slopes to move. It rolls over any obstacle without slowing or changing its direction. Yellow Often seen rolling down mountain trails. Obstacles are just things to roll straight over, not avoid. Stadium Rolls on steep mountainous trails. It plows through grass, trees and anything else that gets in its way. Gold With a free and uncaring nature, it doesn't mind if pieces break off while it rolls down mountains. Silver A slow walker, it rolls to move. It pays no attention to any object that happens to be in its path. Stadium2 With a free and uncaring nature, it doesn't mind if pieces break off while it rolls down mountains. Ruby Graveler grows by feeding on rocks. Apparently, it prefers to eat rocks that are covered in moss. This Pokemon eats through a ton of rocks on a daily basis. Sapphire Rocks are GRAVELER's favorite food. This POKeMON will climb a mountain from the base to the summit, crunchingly feasting on rocks all the while. Upon reaching the peak, it rolls back down to the bottom. Emerald They descend from mountains by tumbling down steep slopes. They are so brutal, they smash aside obstructing trees and massive boulders with thunderous tackles. Pearl It tumbles down slopes, heedless of any body parts chipping off. It eats a ton of rocks daily. Platinum It rolls on mountain paths to move. Once it builds momentum, no Pokemon can stop it without difficulty. HeartGold With a free and uncaring nature, it doesn’t mind if pieces break off while it rolls down mountains. Black It rolls on mountain paths to move. Once it builds momentum, no Pokémon can stop it without difficulty. White It rolls on mountain paths to move. Once it builds momentum, no Pokémon can stop it without difficulty. Black 2 It rolls on mountain paths to move. Once it builds momentum, no Pokémon can stop it without difficulty. White 2 It rolls on mountain paths to move. Once it builds momentum, no Pokémon can stop it without difficulty.